Less than a month after war was declared, Elliot is mentioned in the August 28th 1914 Issue of the London Gazette, which announced his appointment as Second Lieutenant in the 8th (Lanark) Battalion of the Highland Light Infantry. The 8th HLI was a territorial battalion, but it is uncertain if Elliot was in the Territorial Army prior to the war, or received a commission following enlistment. At first Elliot probably accompanied the 8th Battalion as it carried out its coastal garrison duties in and around Edinburgh. However, the Regimental History of the Royal Scots states that, in response to a lack of manpower, two companies of the 8th HLI, who had volunteered for Imperial Service, were seconded to the 1/7th Royal Scots in order to make a full strength battalion. Elliot was one of the officers of 2nd Imperial Service (‘B’) Company. Based on the announcement in the April 28th 1915 Supplement to the London Gazette, this secondment seems to have begun in November of 1914. In the March 28th 1915 Supplement to the London Gazette Elliot, still seconded to the 7th Royal Scots, was promoted to Full Lieutenant. In May, his battalion was mobilized for overseas service, originally for France, but later this was changed for Gallipoli. On the night of May 22nd, while travelling south by train to Liverpool, two companies of the 7th Royal Scots were involved in the Gretna Rail Disaster in which over 200 men were killed. Elliot and his company survived. Having sailed from Liverpool on the ship Empress of Britain, Elliot landed in Gallipoli under cover of darkness on the 12th of June 1915 and received his first experience of the trenches a week later on the 19th. Almost as soon as he and his battalion arrived, they began preparing for an attack on Turkish defences in what became known as the Battle of Gully Ravine. The 7th Royal Scots, as part of the 156th Brigade were to capture Turkish Trenches on the eastern side of the ravine and protect the flank of the main attack by the 87th Brigade. They were given no artillery support and the Turkish defenders knew the attack was coming. Elliot was Lieutenant in command of the 7th Battalion’s machine gun section; as such it was his responsibility to manage the covering fire that would help the Battalion cross no-man’s land. The Regimental History of the Royal Scots credits Elliot’s handling of the machine gun section as the reason that the battalion suffered relatively few casualties in taking the Turkish front line trench. However, despite this success, the Battalion had to halt to allow the second wave to catch up. This gave the Turkish defenders time to regroup and when the Royal Scots resumed their attack, they came under heavy fire and were massacred. Though the second trench was captured, almost 240 men were killed or wounded. Among the dead was Elliot shot at some point during this second advance. Elliot was Killed in Action while leading the Machine Gun Section of the 7th Royal Scots at the Battle of Gully Ravine in Gallipoli. Son of William Elliot, of Muirglen, Lanark. William Elliot (1859 – 1929) and Ellen Elizabeth Shiels (1860 – 1894) married in 1886. In the 1911 Census, William Elliot listed himself as an auctioneer and farmer. According to the history of the livestock auction company Lawrie and Symington, published on its website, Elliot became chairman of the company in 1910 and held that position until his death. Ellen Elizabeth (1887 – 1958), Walter Elliot (1888 – 1958), Elizabeth Alexanderina (1890 – 1903). According to the National Probate Calendar Scotland Elliot worked as an ‘auctioneer’s assistant’ presumably for his father. 47 Gordon Square, London, England visiting with brother, Walter and two older women. Muirglen, Loch Road, Lanark, Scotland. Glasgow Necropolis Compartment Zeta Lair 150? Stained glass window in St. Nicolas Church, Lanark. Memorial plaque in the grounds of Hobkirk Churchyard in Bonchester Bridge, Scottish Borders. Glasgow Academy War Memorial and published Roll of Honour. 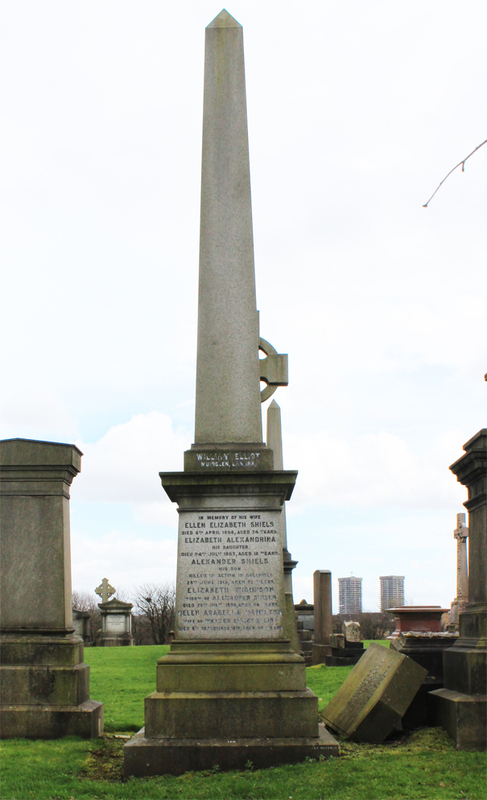 After WW1, Elliot’s brother Walter went on to be a successful Member of Parliament for the Scottish Unionist Party, representing Lanark and Kelvingrove constituencies. Alexander’s uncle on his mother’s side was the inventor Dr. Alexander Shiels. Ewing, J. (1925) The Royal Scots 1914-1919. London: Oliver and Boyd. 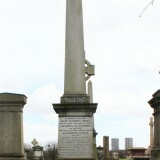 Compiled by Morag Fyfe, Historical and Genealogical Researcher for The Friends of Glasgow Necropolis and an unknown University of Glasgow student.